The Conair Group has introduced two new TrueBlend blenders that can apply bottle flake and other difficult-to-feed regrind without re-pelletizing. “Certain thin, flaky regrind like PET bottle scrap or thicker film and sheet scrap, has granules with relatively large, flat surfaces so they tend to pack together and bridge in conventional hoppers,” explains Jeff Bickel, Blender Product Engineer. The two blenders take very different approaches to handle these difficult regrind materials. For small quantities, TrueBlend blenders can be fitted with side feeders with steeply angled sides that help prevent the regrind from hanging up and bridging. Conair says the material then can flow easily through an oversized opening at the bottom to a horizontal auger that positively conveys granules into the mixing chamber. Ideal for pipe extrusion or similar applications requiring blending high volumes of regrind, the new blenders use “lift augers” to eliminate bridging problems and promote a free flow of material. The lift augers are positioned at an angle in a corner of the regrind bin and, instead of forcing material out of the bin as most conventional augers do, they turn in the opposite direction, moving granules up and away from the bottom of the bin. According to Conair, this movement has the effect of keeping the material loose so that it can flow more easily through oversized side gates and into the mixing chamber. 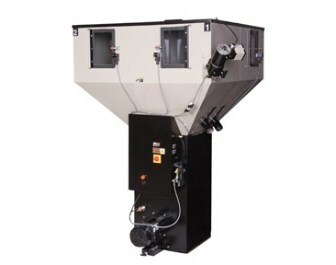 The company adds that when the full-length access door is closed, all pellets are contained within the mixing chamber, thus eliminating waste and improving accuracy. Throughputs can range from less than 50lb/h (23kg/h) on model TB45 to 12,000lb/h (5,455kg/h) on model TB3500. Units with up to 12 ingredient bins can be supplied.